Ultra small-ultra powerful! Just 1/3 of a cubic inch. Great for small boats with limited space! 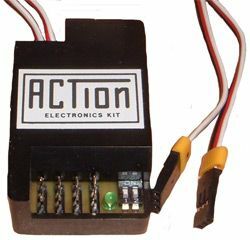 The MicroViper Marine10 is a miniature Brushed Speed Controller designed specifically for use in small scale, low power RC boats. Like its bigger brothers in the Viper range, it is packed full of features, including motor short protection, motor stall protection, adjustable reverse including reverse disable, built in failsafe and is also 100% waterproof. 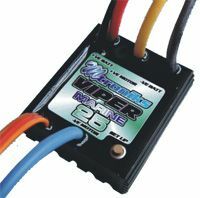 The Viper Marine15 is a brushed speed control designed specifically for use in RC model boats. 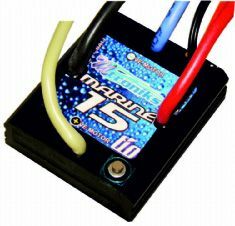 The Marine15 is the perfect speed controller for anybody wanting to either upgrade their old speed controller for a no nonsense 15Amp limit reversible electronic speed control or for anybody who uses scale model RC boats at scale speeds. The Marine15 is a popular choice from the ever popular line of Viper marine speed controls, this is due mainly to all the features that are included, such as a built in failsafe, 100% proportional, fine throttle control in both directions, and motor stall protection, which is a feature that cannot be overlooked when a possible encounter with weeds is always just round the corner. Not to forget that the Viper Marine range of speed controllers are all completely 100% waterproof and designed to work on fully charged 12V Lead Acid batteries! -Dimensions: 1-1/2 x 1-3/8 x 1/2"
The Viper Marine25 is a brushed speed control designed specifically for use in RC model boats. It has a 25Amp motor limit, what this means is that you can use any, DC brushed motor, as long as the current drawn by that motor does not exceed 20Amps under load (with the prop connected, under water). The Marine25 is the perfect speed controller for anybody wanting to either upgrade their old speed controller for a no nonsense 25Amp limit reversible electronic speed control or for anybody who uses scale model RC boats at scale speeds. The Marine25 is a popular choice from the ever popular line of Viper marine speed controls, this is due mainly to all the features that are included, such as a built in failsafe, 100% proportional, fine throttle control in both directions, and motor stall protection, which is a feature that cannot be overlooked when a possible encounter with weeds is always just round the corner. Not to forget that the Viper Marine range of speed controllers are all completely 100% waterproof and designed to work on fully charged 12V Lead Acid batteries! 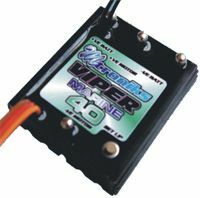 The Viper Marine40 is a brushed speed control designed specifically for use in RC model boats. It has a 40Amp motor limit, what this means is that you can use any, DC brushed motor, as long as the current drawn by that motor does not exceed 40Amps under load (with the prop connected, under water). The Marine40 is the perfect speed controller for anybody wanting to either upgrade their old speed controller for a no nonsense 40Amp limit reversible electronic speed control or for anybody who uses scale model RC boats with larger DC motors at scale speeds. The Marine40 is a popular choice from the ever popular line of Viper marine speed controls, this is due mainly to all the features that are included, such as a built in failsafe, 100% proportional, fine throttle control in both directions, and motor stall protection, which is a feature that cannot be overlooked when a possible encounter with weeds is always just round the corner. Not to forget that the Viper Marine range of speed controllers are all completely 100% waterproof and designed to work on fully charged 12V Lead Acid batteries! 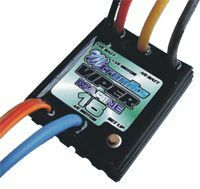 The Viper Marine25 HV is a new brushed speed controller designed specifically for use in RC boats with a battery voltage of between 12.0V and 24.0V. The installation, set up and operation of the new HV Viper range has been designed to be exactly the same as the original Viper range which we have been 'warned' never to change!! 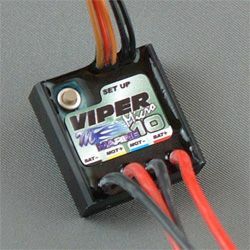 An exciting feature of the new 24V HV Viper range is addition of Lipo battery pack compatibility as well as the usual NiCAD/NiMH/Lead Acid and Gel cells that are more commonly used. It has a 25Amp motor limit, what this means is that you can use any, DC brushed motor, as long as the current drawn by that motor does not exceed 25Amps under load (with the prop connected, under water). The Viper Marine HV controllers also feature the new 4 quadrant control system that stops the motor completely before turning it in the opposite direction. This allows for perfectly symmetrical operation about the neutral position in both directions, allowing the modeller to achieve perfect slow control in all situations. Other features of the Viper Marine HV controllers are the ability to turn reverse on or off. This is done easily by a single press of the set button, allowing you to use the controller in forwards and reverse or forwards only mode and a more powerful BEC, at 2.0Amps the BEC will allow the running of more extras direct from the receiver. The new HV range is sure to become a popular choice from the line of Mtroniks marine speed controllers and is one that we have spent a lot of time thinking about. They all come with features included, such as a built in failsafe, 100% proportional, fine throttle control in both directions, and motor stall protection, which is a feature that cannot be overlooked when a possible encounter with weeds is always just round the corner. Not to forget that the new Viper HV range of speed controllers are all completely 100% waterproof and designed to work on fully charged 24V Lead Acid batteries or a fully charged 6S Lipo pack. -Dimensions: 2-1/4 x 1-3/8 x 1/2"
The Viper Marine40 HV is a new brushed speed controller designed specifically for use in RC boats with a battery voltage of between 12.0V and 24.0V. The installation, set up and operation of the new HV Viper range has been designed to be exactly the same as the original Viper range which we have been 'warned' never to change!! 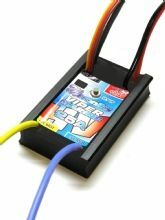 The tio Marine30 is a new brushed speed controller designed specifically for use in RC boats that allows for the use of Lipo battery packs as well as the usual NiCAD/NiMH/Lead Acid that are more commonly used. It has a 30Amp motor limit, what this means is that you can use any, DC brushed motor, as long as the current drawn by that motor does not exceed 30Amps under load (with the prop connected, under water). 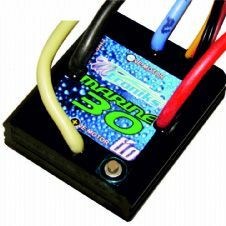 The Marine30 is the perfect speed controller for anybody wanting to upgrade their old speed controller for a no nonsense 30Amp reversible electronic speed control or for anybody who uses scale model RC boats at scale speeds. The Marine30 is fast becomming a popular choice from the new line of tio marine speed controllers, this is due mainly to all the features that are included, such as a built in failsafe, 100% proportional, fine throttle control in both directions, and motor stall protection, which is a feature that cannot be overlooked when a possible encounter with weeds is always just round the corner. Not to forget that the Viper Marine range of speed controllers are all completely 100% waterproof and designed to work on fully charged 12V Lead Acid batteries or a fully charged 3S Lipo pack. Automatically control the relative speed of two motors on your boat to achieve extremely sharp turns. As the rudder stick on the radio transmitter is pushed to a greater degree, the motors will change speed to pull/push the boat. Extreme rudder movement will cause the inboard motor to reverse for a tight turn. Works in both forward and reverse. This solid state, micro processor works with any radio system and speed controls. Output connectors provided for the rudder servo and speed controls. Must have 2 speed controls to work. Includes LED power on indicator lamp. Case size: 1 x 1.26 .79"